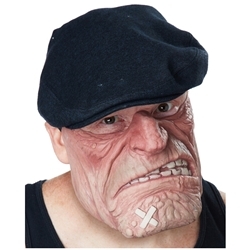 The comic book brawler mask gives you the look of a henchman straight from the comics. The design of this mask allows you to build a costume around it. Pick out a hat to match the character you want to create and take it from there. The comic book brawler is a 3/4 face mask, it covers from the ears, over the nose, and down to the chin leaving your eyes open. Mask is one size fits most using a Velcro and elastic sizing strap. You can let your creativity run wild with this mask, to achieve the look pictured pair the mask up with a mini-apple hat. Hint: This mask adds some padding and size to your face, continue that down by bulking up your body with either a muscle shirt or fat padding.